We all know how those home remodeling projects turn out; three times longer than expected and twice the cost. You can imagine the multiplication factors involved if that’s on the commercial side of the equation. Our remodeling project for the exterior of our building began a little more than one year ago. And on Monday October 31, 2016 we saw the culminating element put into place — our exterior signage. The exclamation point that says, we are here, and we are here to stay. 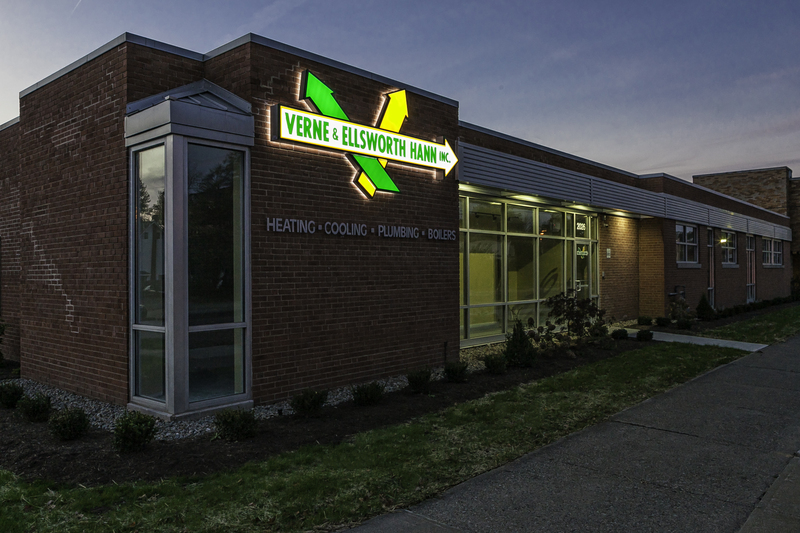 Not only is Verne & Ellsworth Hann one of the oldest tenured businesses in Cleveland Heights, we are one of the oldest tenured heating and cooling companies in Northeast Ohio. We’ve witnessed a lot of innovation over the years, and our technicians have stayed abreast of all of those advances. But now that we live in a world of accelerated change, it takes even more skilled people at all levels of our business to make sure the next generation of heating and cooling systems will be reliably installed and maintained. We often feel we a foot in each century; having to repair and maintain equipment that has been around since coal was the primary heating source, as well as the 21st century high efficiency equipment that can provide comfortable, even heating in your home while exhausting nothing more than vapor. If your home was built in the 20th century and you’re interested in a 21st century solution to your heating and cooling needs, call Verne & Ellsworth Hann at 216-932-9755. And if you drive by our building at 2026 Lee Road in Cleveland Heights take a quick look at our completed remodeling project. Hopefully our lawn will start to come in before winter arrives.